How fantastic. Sun, sun and sun in Santa Pod for the final weekend of the European Championship. The team arrived on Thursday and made everything ready to put down some good runs. But in the first qualification Danny’s car suffered a broken transmission. In the second run of the day Danny had to drive through shake and the car was moving to the left and to the right. Still a nice 5,98 sec. And the most important, the chutes came out and deployed just perfect. On Saturday Danny and Ulf were shutt off after Leif’s rear tyre blew. After some time to cool down the motor we had a re-start. Again tyreshake for Danny and a 5,95 sec. That puts us in third qualifying place. In the last session Danny’s car hit shake once again and moved to the right so he had to get off the throttle. No improvement. During the evening the team did a thoroughly service to the car and made it ready for the eliminations. On Sunday again a beautiful blue sky. As there was only a field of 4 Funny Cars we immediately had to go to the semi-finals. We were up against Leif. Just as Danny started the burnout, the car stopped and had to be pushed back. So disappointing. Certainly not the way we wanted to end the season. Back at the trailer we searched for the problem but couldn’t find anything wrong. The car was started up a couple of times and everything seemed to be working fine. The bumps on the track are very hard on the parts and the cars are bouncing from one place to the other. Hopefully we will see new developments on the track next year. 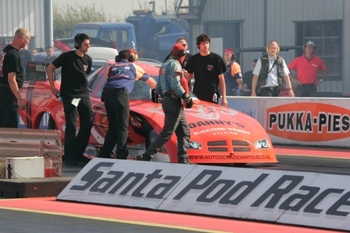 We leave Santa Pod as runner-up in the European Championship, which makes us very happy!! We had our first event win this season and made it two times to the semi-finals and two times to the final. After the big crash in Tierp last june these results are more than satisfying and makes us eager for next season. If everything goes well Danny’s racing team will be taking the two funny cars to the Drachten Finals on the weekend of 5-6-7 of October. So come on over and visit our pit. Or you can come to our annual support BBQ on Saturday 20 October. More info at www.dannycars.be. We would like to thank our sponsors Iso-Mobile, Rico Tools, Marcover, Speedshop Belgium, Harteveld.nl and Deukie.nl.